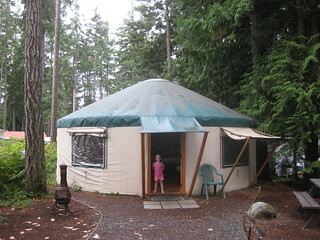 Now I want to live in a yurt – Naming a blog is harder than naming a kid. My family, eventually, wants to own a home. They’re expensive, around here, and we need to stay around here. We need four bedrooms, we need not to have a lot of stairs. We need rooms for dogs. 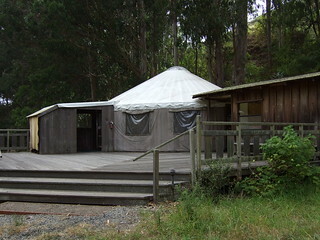 Then relevant to an entirely different discussion, my friend Sarah pointed me at yurts. I want maybe a quarter acre. I want four yurts, maybe five, smaller ones for bedrooms, bigger ones for a shared space for me and Owen (he says he’s happy to sleep in a loft) and and maybe a smaller warm cooking/socializing space. They can be on decks with big verandas, shared decks with partial roofs, or connected by causeways, etc. Depending on how functionally and financially sensible it seems, we can also use either yurt-space or wooden buildings for a workshop. These will need to be plumbed, wired, and with the various options we’d each need (like taller walls, insulation, proppable vent dome, and you know I’d get radiant floor heating) costs would add up, like maybe 10k-50k per building all told, but that’s still lots cheaper than building a house on property here. The property would be the most expensive thing. I wonder how easy it’d be to get permits. I wonder the extent to which my family would be all for it. That’s probably the biggest hurdle. Headed for New England: What are we forgetting?